Targeting Redfish in Tampa Bay is one of the crown jewels and most exciting fish to go after in the area. As a matter of fact, Redfish anglers span across the state in a socially joint fishing lifestyle. Tampa Bay is set apart as a place where Redfish angling is available year round and comes in a slew of seasonal phases, from slot sized to heart pounding beasts like the one pictured above. There is no greater feeling than laying down that presentation ahead of the golden red tail waiving like a flag in the skinnies of Tampa flats and backcountry pockets. 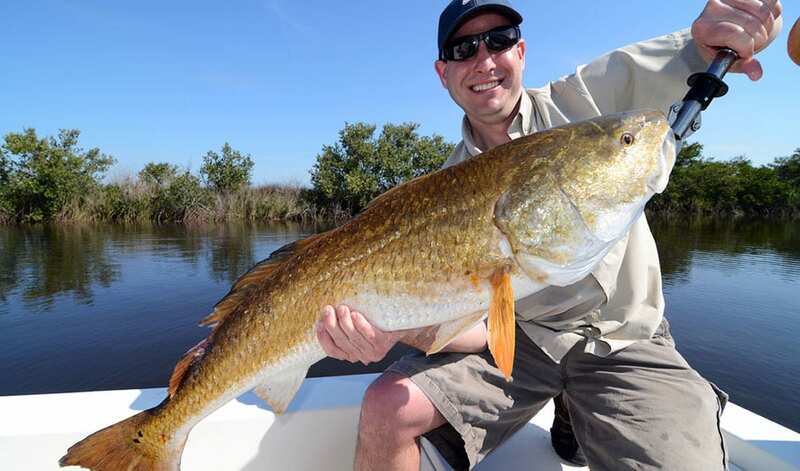 One of the beauties of Redfish fishing is the scope in which they are available. Scope refers to not only bait selection, but location and season. In that regard, I will not offer a step by step breakdown of tactics, as each tactic can result in literally pages of information. What I will offer is an overview that, if applied, will get you hooked up with a spot tall in Tampa waters – Find Them. Flats: When the water is low, hit the edge. Most of the time Redfish will pull off of the feeding ground and wait in the next closest body of water for the next tide. Due to this concentration, there is little food to go around. Feed them in this posture, they will bite. Seems to work best when working off the flat and casting into the deeper pockets. At higher tides is when you do what every fisherman dreams of, sight cast those tails! Grass Fats in Slightly Deeper Water: This is where you pull off into usually at low tide. The same grounds where Trout will be laid up, will also hold Redfish. What to look for is sand pockets within the grass in about 3-4 feet of water. They like to get into the pocket and work the grasses edge. Here is where small crustaceans hold up. Sometimes they can be seen spinning like a tornado in a sand pocket stabbing at the edge. Channels: Channels are another low tide area, specifically channels that are wedged between mangrove lines and a skinny flat. Again, they are waiting for that tide to come in to get back on the skinny stuff. Working through these channels across the width can show great success. Something else I will through in this category is the mouth of a flat. You have a channel that leads from open water and goes into a backcountry area where the mouth contains flats on either side – it’s pure gold at low tide. 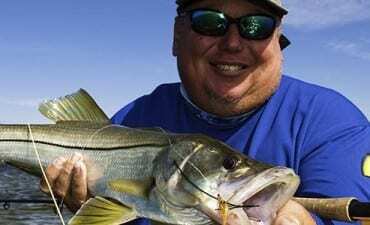 Best bet is to get into it as skinny as you can, and cast out into the mouth and bring it back to the channel. The real magic here though is to work the edge, not the middle. Once found, Redfish are aggressive eaters when feeding. Like any other fish they do not appreciate a head slap with a bait, but they will enjoy a moving target that comes ACROSS their path. This can be anything from a fly, a jig, a hard bat, or live bait. What I find that seems to trump bait itself, is bait retrieval speed. Here is a general rule- the hotter the faster, the colder the slower. When its cold, go as slow as you think you need to, and then slow that down.